I got this 8 disc set off CDUniverse some months ago for only $16.97 plus shipping! I'm not sure how they did it for so cheap, it was a pre-order, and once it was released it took a huge jump in price, but its some fantastic music, I had not had much exposure to Tchaikovsky prior outside of the obvious (Nutcracker, 1812, etc), but I thought this was a really good set, but I haven't really heard any recordings to compare it to. It's mostly Abbaddo, but there's a few discs of Tilson Thomas with some Zubin Mehta here and there. That's certainly a great price for 8 discs, and if you've never heard the symphonies...they are great, aren't they! At some point you may want to investigate some other individual recordings, such as some of Mariss Jansons' work with the Oslo Philharmonic, or one of my favorites, Leonard Bernstein's recording of the Sixth Symphony, one of his last projects with the New York Philharmonic. I just heard the Met's recent Eugene Onegin yesterday for the umpteenth time, and it's quite a superb opera if you are inclined toward the genre. The vocal writing is tremendously moving, and the score also includes some exciting dance sequences for the orchestra. I don't know where you're located, but here in NYC they're showing it again next week on public television, on Thursday, April 26.
the few i've heard from that box are really good. Despite my initial expectations upon obtaining this box, I enjoyed Tilson-Thomas' contributions more than Abbado's. For the price, a great bargain for sure. That is a wonderful price. With the exception of the Jansons, I generally avoid reccomending Tchaikovsky Symphony Sets. For the early symphonies, my preference is Abbado, for the the 4th and 5th, Karajan or Ormandy. Muti on brilliant classics is cheap and well regarded. You can also get Mvarinsky quite cheap sometimes, which is 4-6 and is amazing, especially the 5th. I know BBC Radio 3 recently picked it out as their favourite and I can understand why. 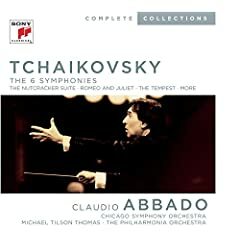 I personally don't like Abbado in Tchaikovsky, there is loads better out there! I know even Karajan haters say they like his Tchaikovsky, but I love Karajan and never listen to it. But that, if you are interested, is really cheap. Gergiev was listed in a similar vain as a modern alternative to the 5th. Muti is cheap and a great place to begin. Markevitch's set is also superb and warmly recommended. For Karajan, I love his Sixth, and is my personal favorite of the symphony. Still need to get Gergiev's set. My CD of the year last year was an utterly stunning reading of 5 and 6. 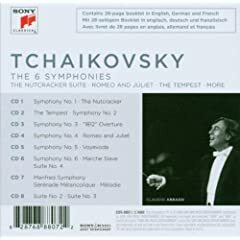 I don't know how it compares to Mravinsky or Markevitch, but this recording just blows me away every time: Matacic and the Czech Philharmonic on Supraphon (couldn't find a good image of it). Once I dimmed the lights, put on headphones and No. 6, and closed my eyes; when I was interrupted I couldn't believe the world I'd left was still around me. It was a stunning journey. Tchaikovsky is a decent composer. That's what is often said about Dittersdorf. I thought what they say about Dittersdorf is: I-V-I and I-IV-V-I? Dittersdorf is a great composer if it weren't for the existence of all other classical era composers. PC 1, VC, Symph 5, Symph 6, Symph 1. Enough said. and those are decent pieces. Haha, and you are a fool. perhaps, I still think Tchaikovsky is a decent composer, not Great, decent. Symphony 5- well, minor-major, mmm, who else has done that in his 5th symphony? Symphony 1- i think i looked at the scores, not very impressive. symphony 6- perhaps most impressive of all of his works, but still, i felt that he had a "miscarriage" in the third movement. I can swear that it felt as if the symphony was over when that movement ended, but then, there is the slow movement.... he should've rewritten the scherzo, i guess he didn't really have the time, too bad. PC-1 Not decent; probably, technically, arguably the most difficult piano concerto ever written, from the fast cadenza octave passages, to the technically demanding passages of the first and last movements; there's also GREAT melodic material, which is why you've admitted to "whistl[ing] the opening theme." I admit the trombone fanfare and the piano's banging of chords in the opening of the PC is very catchy, but you're not thinking about the rest of the PC. Symph 5: Beethoven to answer your hypothetical q. Of course Tchaik goes from minor to major; Tchaik, arguably, conquers his introversive (homosexual?) struggle in the last movement with his FOUR trumpets (and changing thematic/melodic material from minor to major is a common way of showing such triumph. To undermine Tchaik's fifth because of similarities between his and Herr B's Fifth doesn't hold as an argument. That same argument would apply to Brahms; and to call Brahms decent deserves nothing short of a torturous death. And you can't knock that beautiful french horn in the second movement. Symph 1: You can't just look at a score to see whether or not a piece is impressive. Tchaik really captures the mystery (for lack of a better word) of winter. Symph 6: I would not say that Tchaik's 6th is his most "impressive of all his works." I see what you mean with your comment about the "'miscarriage' in the third movement," but what a finale, and what a dramatic opening (even though it's very similar to his fifth). Wow, I couldn't disagree more. The Sixth is built around an idea in my opinion which Tchaikovsky sketched in one of his other symphonies: "No, no, there is no hope." The first movement's intro-expo-development acts as a sort of overture for the whole work (again purely opinion): expression of profound emotional turmoil, followed by an expression of hope (the second subject) which is built and built until it seems to be winning the day with its lyrical consolation - only to be cut off by a reminder that fate will conquer all, in the most mortifyingly powerful of development sections. This pattern encompasses the whole symphony: the first movement can be seen as a mirror of its own opening, full of turmoil and despair; the second and third movements as the return of hope and consolation. Eventually we seem on the road to triumph, to success. Our hopes build up - our fortunes rise - as in the first movement's second subject - and we reach a final shatteringly joyous climax, sending us up to the heavens - and then! My idea on the Fifth Symphony is similarly strange. I've always felt the final coda seems fake not because it is, but because it's ironic. To my mind the finale has always been the most tragic part of the symphony, because of some sort of unstated loss, some sort of feeling that this is not really the end. Maybe it's just in my head. I didn't mean to kill the thread! No, that's the brilliant thing about it. You've got this incredible downer of a finale, which is made all the more depressing by utter triumph it negates. Wow, I couldn't disagree more. On stage however, a lot of people unfortunately keep thinking that the 3rd is the Finale. A lot of cheering and applauding, some annoyance and some laughter: not the ideal mood to begin the fourth movement. Great symphony though, already twenty years one of my favourites. The Naxos recording of the two Suites for Orchestra was a nice surprise, especially in discovering where two of the pieces in the film "Music Lovers" came from. The "Scherzo Burlesque" from the 2nd Suite was quoted at length in the beginning, an amazing little composition inself with the rest of them eminently danceable. Tschaikovsky, no less than Johann Strauss Jr., was a competent and melodious craftsman of the Waltz. There are beautiful exemplars in the 2nd Suite, the Piano Trio and the Serenade for Strings. The Waltz in the Pathetique is ingenious in its 5/4 rhythm and as a matter of fact IS the "Scherzo".